ViroScore® is a downstream analysis software developed by ABL, able to handle SANGER sequencing data and intended to be used for performing genomic data analyses (genotyping, subtyping, amino-acid mutations detection, nucleotide changes characterization…) and clinical interpretations (drug resistance,…). Compatible with Electrophoresis Capillary platforms, ViroScore® is available mainly for HIV. It stores, organizes sequencing data in a dedicated database format and performs several types of analyses and interpretations to generate reports to be used either for research or for routine use. The ViroScore® software system is a secured web application which can be used through a Cloud access or locally, through pre-configured servers. It is made available with regular updates (new clinical databases, guidelines…) and quarterly upgrades (new features, modules, applications…) and can be fully integrated within the IT network of each laboratory (integration with the sequencing platform, with the Laboratory Information System – LIS, with the Hospital Information System – HIS…). 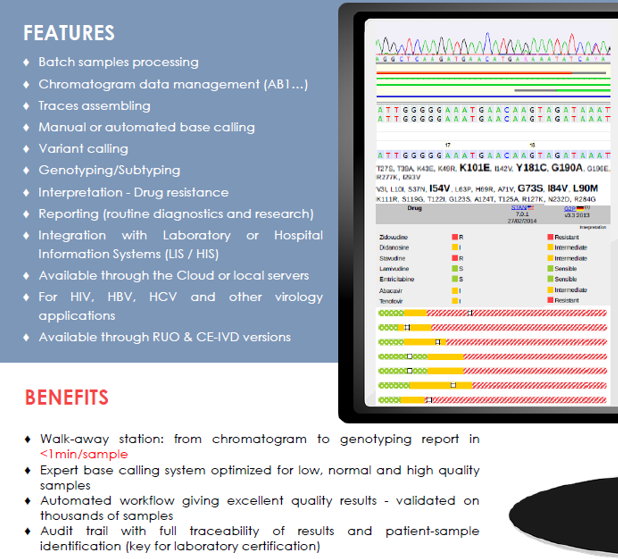 The Premium version of ViroScore®-HIV is able to automate the entire bio-informatics workflow starting from electropherogram data in AB1 format to the clinical report. The entire analysis can be tackled in no more than a minute. 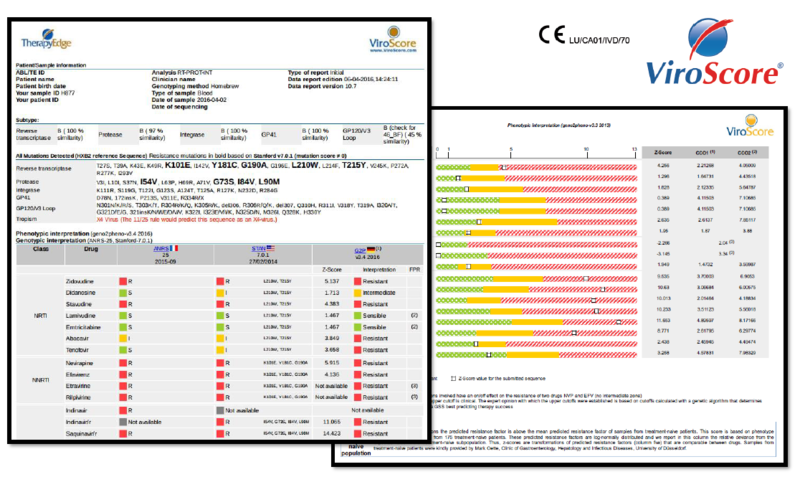 The ViroScore®-HIV application is CE-IVD (LU/CA01/IVD/70).